This vacant school in the heart of Denmark served students from its construction in 1920 until 1985. It is widely suspected that the school was designed by renowned architect and Harstville native Charles Coker Wilson, who is responsible for many South Carolina buildings including the State House in Columbia. Wilson designed the former two-story Denmark School that was built in 1908 and once sat next door to this school. No longer extant, the Denmark School served students from grades one through ten before adding an eleventh grade in 1911. As the student population of Denmark grew in the early twentieth century, the need for a separate high school became pressing. Denmark High School was built to relieve crowding in the Denmark School, and a covered walkway joined the two schools. 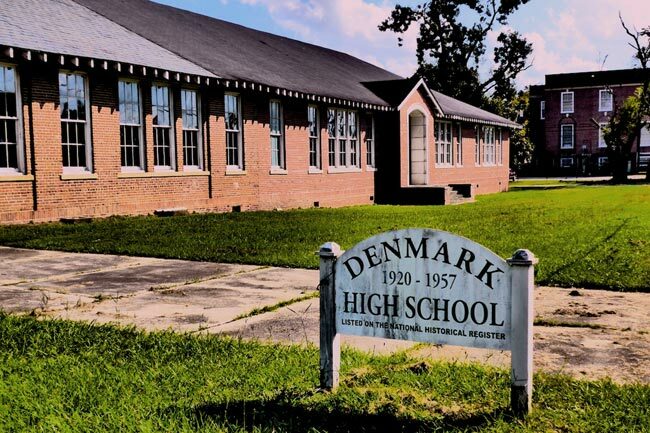 Denmark High School expanded twice: once in 1932 when a gymnasium, two restrooms, and four classrooms were added, and again 1948 when eight more classrooms and two more restrooms were added. Following the 1948 addition, the school added a twelfth grade. In 1957 the school consolidated with nearby Olar High School and moved to a new building nearby. When the Denmark School was demolished in the 1960s, the former high school was used by the elementary school until 1985 when a new elementary school was built. Denmark High School has remained vacant ever since. Built in 1920, Denmark High School is an excellent example of Classical Revival educational architecture. The school was significantly enlarged in 1932 and again in 1948 to include a gymnasium and additional classroom space. The original 1920 building, likely the design of Charles Coker Wilson, is laid in five-to-one American bond pattern, contains a soldier course water table and features as its centerpiece a projecting parapet-gabled entrance pavilion with a double-leaf entrance and a two-tiered arched glass transom and archivolt. Denmark High School closely resembles other examples of Wilsons’ schools of the same period that typically feature cupolas, chevron-patterned and glazed color tile friezes, similar floor plans, functional layouts, and architectural treatment like the features of this school. This school also has a hipped roof that is clad in gray slates and features exposed rafter tails. Denmark High served the educational needs of the town of Denmark from 1920 to 1985.